Religious pilgrims were crossing a bridge when rumors that the bridge was collapsing caused the panic. NEW DELHI — Uma Devi was halfway across the bridge when people started shouting that it was collapsing. January 2011: More than 100 people are killed in a stampede at the hilltop Sabarimala Hindu shrine in Kerala state in southern India. September 2008: About 250 Hindu pilgrims die in a stampede at the Chamunda Devi temple in the scenic Mehrangarh Fort in Jodhpur in northwestern India. August 2008: At least 140 people are killed in a stampede triggered by rumors of a rockslide at a hilltop Hindu temple in Himachal Pradesh in the Himalayan foothills in northern India. January 2005: More than 340 Hindu pilgrims die in a stampede during a pilgrimage to the remote Mandhar Devi temple in western Maharashtra state. August 2003: At least 40 pilgrims die and 125 are injured when devotees waiting to bathe topple over a flimsy fence, triggering a stampede at the Kumbh Mela bathing festival in Nasik in Maharashtra. The stampede killed 115 people, mostly women and children. Some were crushed to death, while others jumped off the bridge to escape and drowned. Scores more were injured. They were among the hundreds of thousands of Hindu pilgrims who had come to the Hindu temple in the remote town of Ratangarh in Madhya Pradesh state on the last day of a popular festival. Many bodies were pulled from the river, but officials said others may have been washed away. It was not immediately clear how many people were on the bridge when the stampede occurred, but local media said some 500,000 people visited the temple honoring the Hindu mother goddess Durga. Deadly stampedes are relatively common at temples in India, where large crowds gather in tiny areas with no safety measures or crowd control. In 2011, more than 100 people were killed at a hilltop shrine in the southern state of Kerala. This is the second time people have died in a stampede at the exact same spot. In 2006, around 50 people died on or around the previous wooden bridge, prompting authorities to replace it with a bigger, two-lane concrete span. Adding to the chaos, police wielding sticks charged the crowd to try to contain the crowd. That prompted people to retaliate by throwing stones at the officers, said Dilip K. Arya, deputy inspector general of police, said. One officer was badly injured. Relatives crowded a state-run hospital to collect bodies and searched frantically for loved ones among the injured people being treated there. 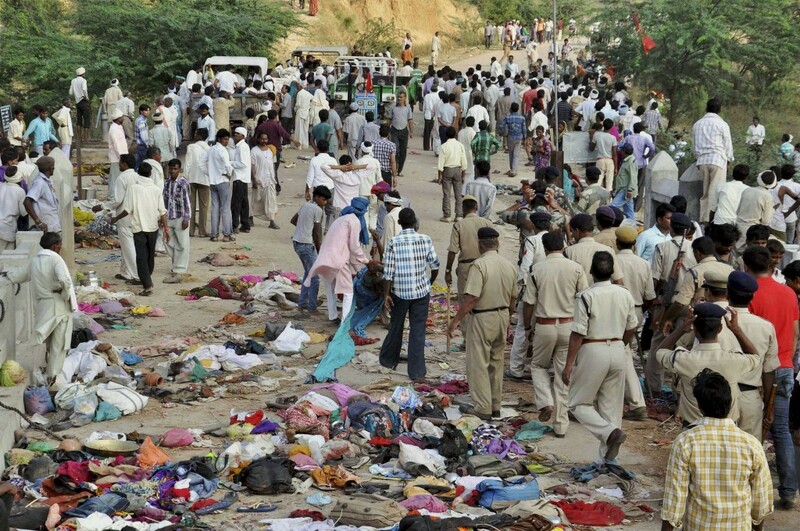 Arya told reporters Monday that 115 people had died in the stampede. He expected the toll to rise as some of the injured were in a critical condition. The state has ordered a judicial inquiry. Engineers say the bridge was not damaged, and images from the scene showed vehicles and people using the bridge after the stampede occurred. Prime Minister Manmohan Singh expressed “deep sorrow and shock over the loss of lives” and asked local officials to help the injured and the families of the dead. “On this day of festivities, our hearts and prayers are with the victims and their families,” the prime minister’s office said in a statement.